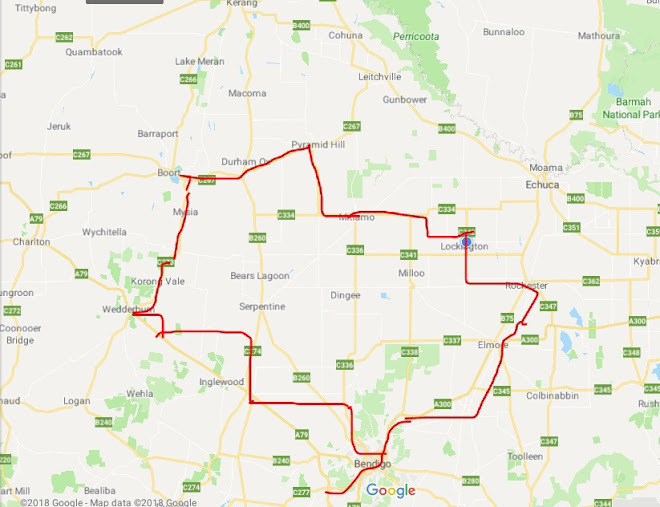 Well we woke to another grey and gloomy day with the threat of rain ... we listen to the ABC weather forecast which is about as vague and broad ranging as you can get and it doesn't help when we cannot figure out which region we are cycling in! We think it is South Queensland is the name for this region, but unfortunately when they say the forecast it is very 'vague' so we are not sure if there is going to be rain or even where the wind is coming from! But once on the road we knew the wind is coming from the west south west direction but not as strong as it was yesterday so we could comfortably sit on 15-17kph. Our first stop was at Talwood which was 20km along the road and there were 3 caravans around the footy field camping there - it also had toilets, drinking water and showers and as an extra they had power points but there is a maximum stay of 2 nights (so people don't abuse the 'system' and believe me there are people who really abuse this 'free camping system' like at Tullibigeal!). So it was a pity we had such a strong headwind yesterday we may have made it to Talwood and could recharge the computer! So we had a quick break there and continued on. Nothing really happened along the way - there is alot of bush and shrubbery along the way so bush camping would be easy to find tonight if Weengallon didn't turn out to be suitable for the tent (Camp 5 book said the Weengallon rest area is not suited for tents). The country side is very lush and green (due to the recent flooding!) and there is alot of water lying around - we assume from the recent rains and every creek and damns are full of stagnant brown water! While cycling along we saw a kangaroo and also an emu which started out on our right hand side and ran with us and then decided to cross the road in front of us and that is where Kouta saw it and decided to go besserk and bounce like a little puppy and get all excited over this "enormous chicken" that was running next to us! Oh he really loved that 'chicken'. He also gets 'funny' with Apostle birds, they are everywhere up here but as we cycle past and they are chirping he begins to move about and get excited and makes funny noises - so I am not sure if he is trying to chirp like them, or that their chirping annoys the crap out of him and he is making a whiny noise to let him out so he can "deal" with them?!!! We made good time to Weengallon and found the rest area to be suited for tents as there is a huge semi grassed/tussock area next to it so we decided to stay here rather than bush camp - one because it has a toilet (but no shower so a British bath tonight!) and two it has a power point so I can do the blog on word pad and copy and paste tomorrow when we get to St George! It does say that it has drinking water but even that smells funny but we have enough with us for tomorrow and if we run out the hall next to the rest area has a rain tank. At the corner of the field Neil came across this flower and it probably is the only 'colourful' thing around here since everything is either green or brown!!! When Neil saw the old local tennis courts he said 'this is what they mean by "lawn" tennis!!!' I thought that rather funny, but the new tennis courts are across the road as I can hear kids playing tennis at the moment! Tomorrow we should reach St George and I am hoping the caravan park is a damn site better than Goondiwindi! this time someone has recommended the one we are going to stay at!